Meanwhile, the Ikea bags are 99 cents. Remember that part in Zoolander when Mugatu shows off his brand new line, Derelicte, and it's basically street garbage on models? As Mugatu himself says, it's "a fashion, a way of life inspired by the very homeless, the vagrants, the crack whores that make this wonderful city so unique." Anyway, apparently the folks over at Balenciaga recently watched that movie and said "Hey! That's some inspired stuff!" because the fashion house just debuted a tote that is, quite literally, a fancy version of a cheapo Ikea bag. The "Arena Extra-Large Shopper Tote Bag" has the same old, crinkly plastic look, but at more than 2,000x the price!!! 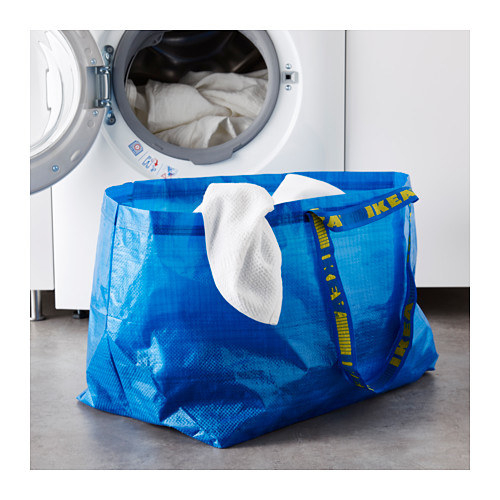 As a little refresher, here's the humble, 99 cent Ikea FRAKTA bag, last seen huddled in a laundromat or filled with junk in your garage. Sure, it's pretty, but can the Arena's "blue wrinkled, glazed leather" stand up to an entire spilled container of laundry detergent? Will it crumble into a misshapen ball at a moment's notice? WHO KNOWS! 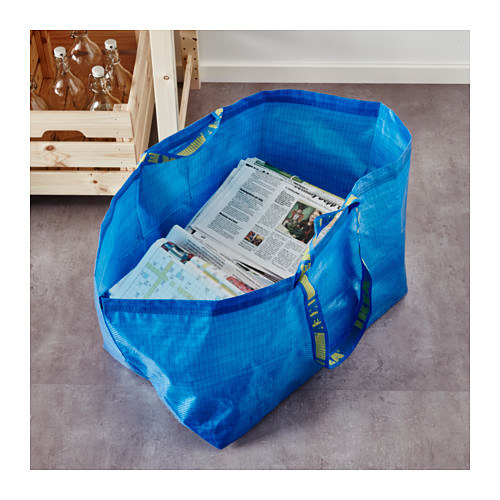 Ikea leaves no mystery as to what its carry-all was designed for — it's pictured on the website holding laundry and newspapers, aka peasant items. And although Balenciaga doesn't do us the same favor with their knockoff, we have a few guesses as to what they had in mind when designing it. This is not the first time Balenciaga has ventured into the "expensive version of pedestrian items" realm. Just last month, the $3,670 "Blanket Extra-Large Square Bag" made its debut. YOU'RE NOT FOOLING US, FANCY DESIGNER PEOPLE!! !